While on holiday last month, we received the most exciting parcel in the mail. On the box, it said ‘LIVE INSECTS, OPEN IMMEDIATELY!’ And sparked a lot of curiosity and excitement. We opened up the box, a gift sent from our very clever friends, and inside was a cup of caterpillars waiting to become butterflies! How very cool. A bit of biology, a bit of beauty — both waiting to come to life! 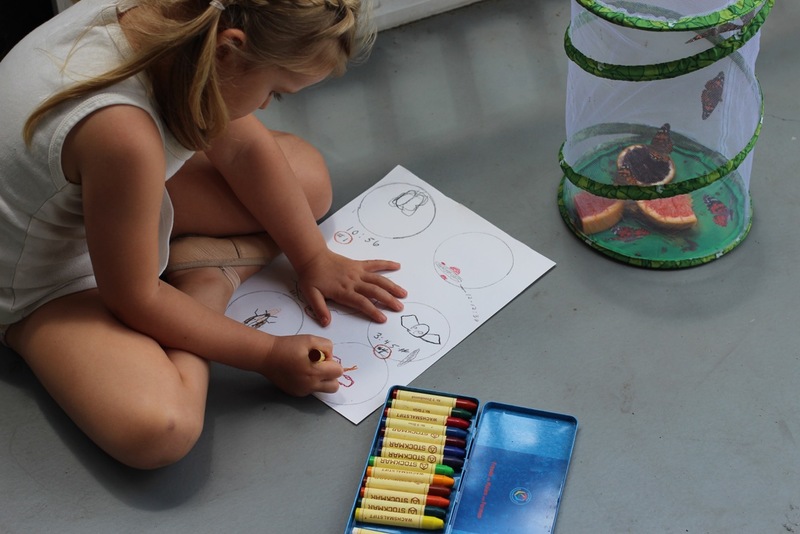 The Insect Lore Butterfly Garden Box (available here on Amazon UK and US and the EU) contains a mesh house, and some other cute surprises like seeds for growing butterfly flowers— so sweet! And the instructions contained a lot of interesting facts that we all found fascinating. But first, we had to place the cup in a quiet and cool corner for five days (out of the reach of the littles)… then we had to wait. Having patience was tricky, but we visited the cup frequently to check on progress, and let nature do its thing. 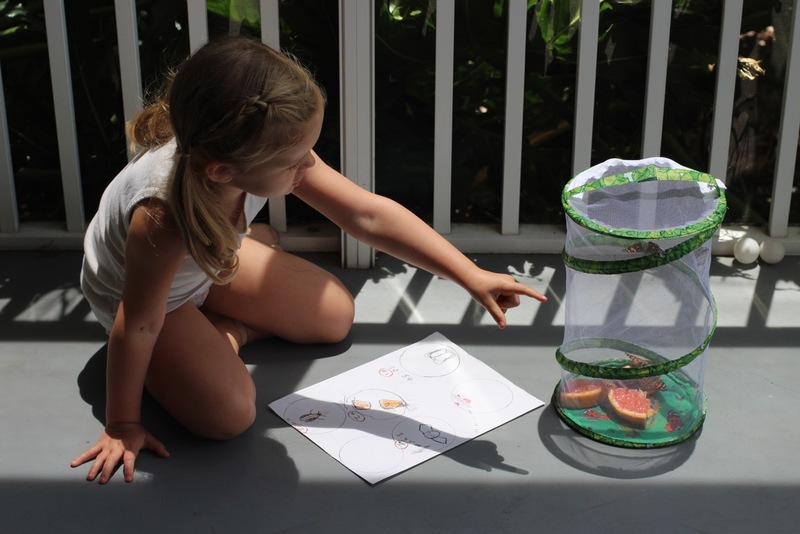 When the time came, we watched the metamorphosis: the caterpillars turned into chrysalis, and it was then time to move them to their mesh house and feed them. 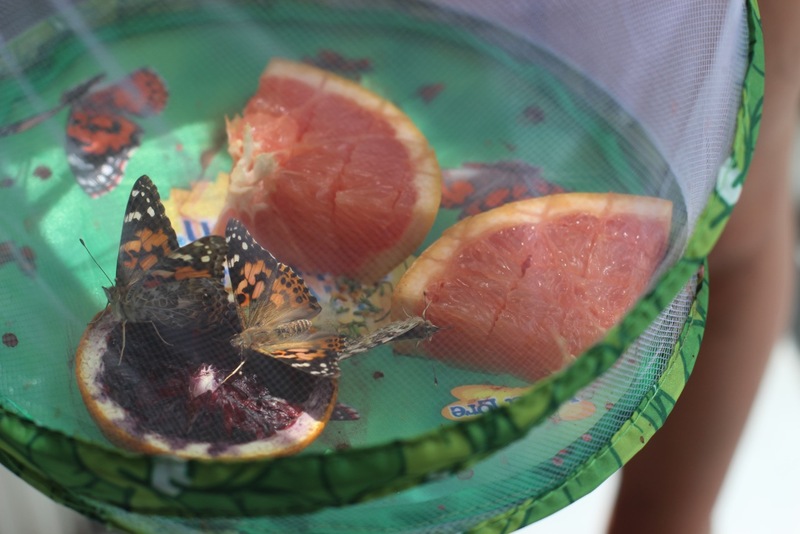 We chose to feed them pink grapefruit and blood oranges —native fruit to Florida since we were on holiday. 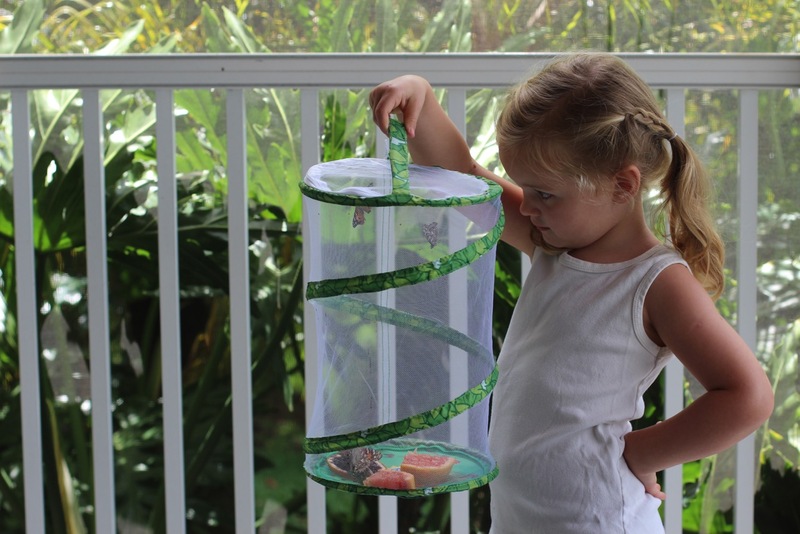 Then we carefully placed all the chrysalis into the mesh house and then… more waiting. 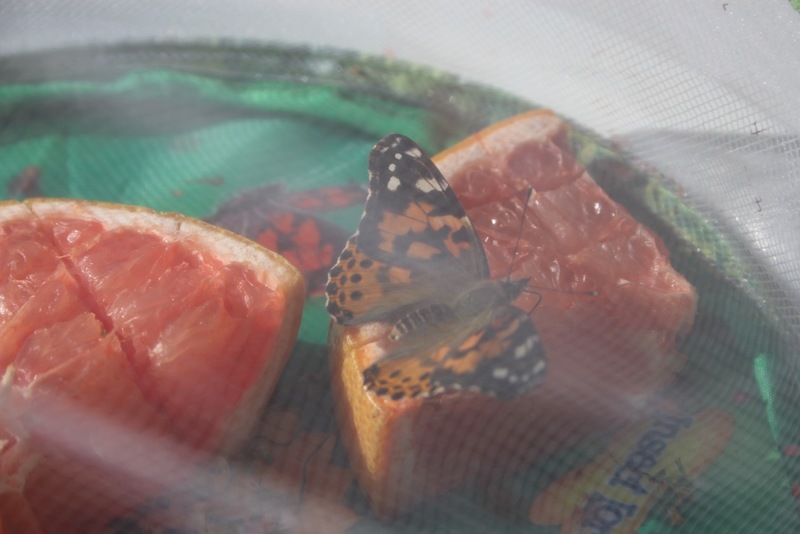 To transition them to the natural environment, and to prepare us for soon releasing them, we brought them outside to the porch for a day. This is when we really enjoyed watching and studying them. They were especially active, and loved the feast of citrus fruits. Then, as the day began to set, we brought them outdoors to set them free. When we unzipped the mesh house, we didn’t know if they would all fly away at once or not. Surprisingly they didn’t. But as Joseph watched in awe, Beatrice set them free, and they fluttered away from her hand. It was a really beautiful moment, and one that we really were all touched by. It was sad to see them go, but thrilling as well. 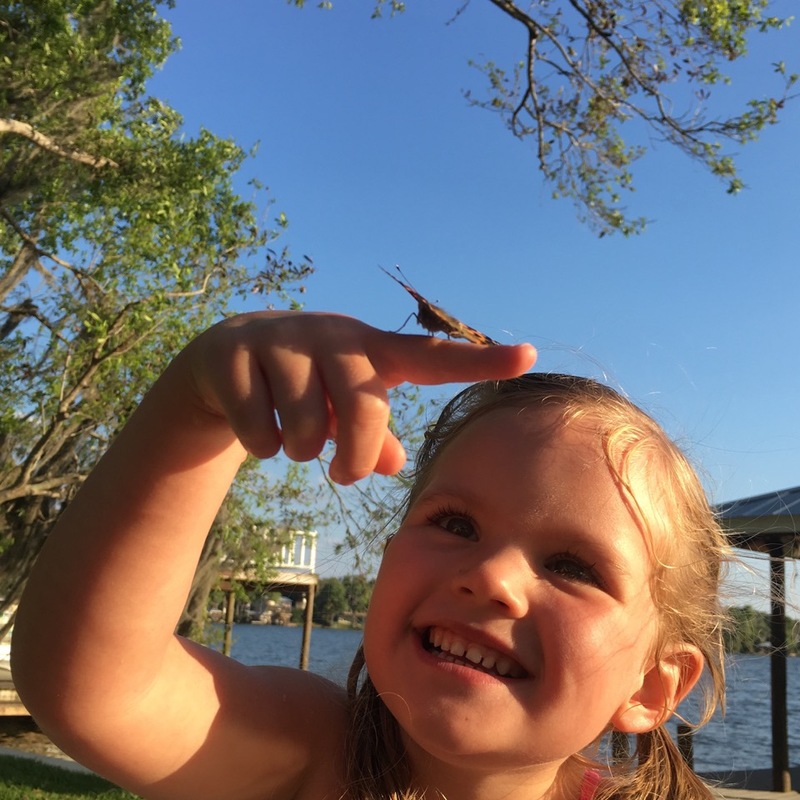 The very next morning, we went outdoors to say goodbye to the lake, and when we looked up, there it was, one butterfly sitting outside of the porch. 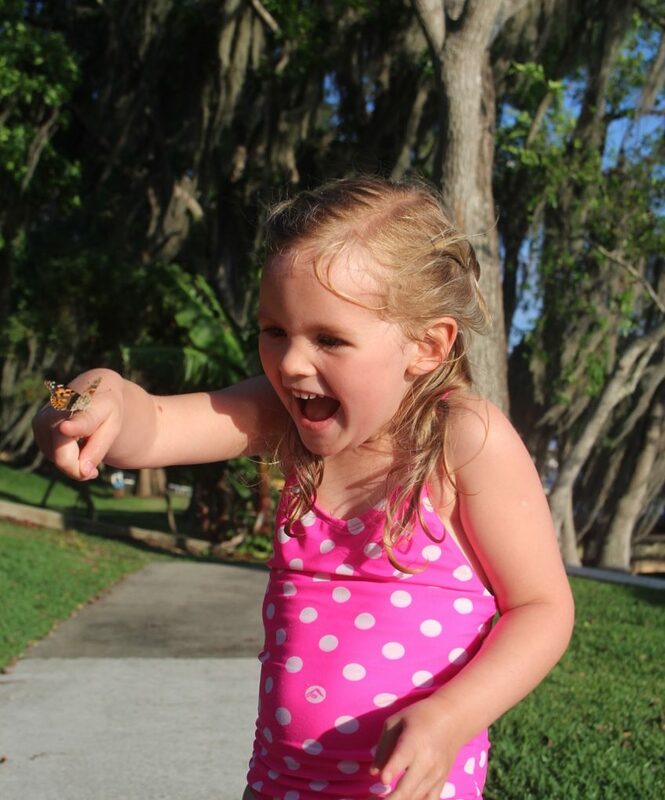 We are pretty sure it was one of our butterfly friends coming back to say a final farewell! We said, goodbye, and the butterfly suddenly flew away. A goosebumps moment. Magical! This is a fabulous interactive, educational, fun, fascinating, and perfect present for kids, and adults, of any age. We hope somewhere this summer or beyond, you enjoy this set of Painted Butterflies. A bit of biology, a bit of beauty. p.s. They also sell educational school kits with 33 butterflies. And we were happy to find out that Beatrice’s nursery is doing this activity in a few weeks time too… how lucky to do this again! p.p.s. You can read more about butterflies and how to prevent their decline. I was part of this experience and it was awesome! Try it with your family. Schooling in Switzerland -- early independence and lots of the outdoors!